It's deflating to finally find that rare roll of packing tape, only to waste time (and tape) picking and ripping to get it started. This DIY dispenser kills those two birds with one stone.Instructables user Creativeman made his own quick-dispensing tape organiser with five pieces of wood salvaged from a two-by-four and a few nuts and bolts, but by checking out the piece sizes and reading the comments, you get the idea that any solid materials could be shaped into this kind of project, with or without serious tools. Especially handy around holiday and birthday times, but generally great for anyone who's ever cursed a roll of clear plastic tape that got stuck to itself. 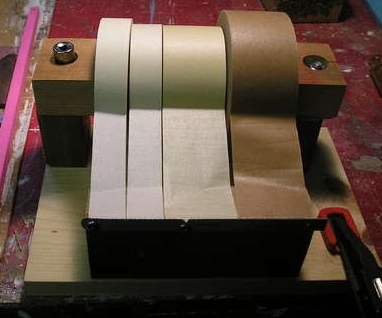 Got your own tape tamer creation? Share it in the comments.